Belvedere Pink Grapefruit is distilled from whole pink grapefruits - a first for Belvedere - and is combined with fresh ginger and spring lemons. Distilled to partner with fusion cuisine, like pan-Asian, Mexican, and Mediterranean. 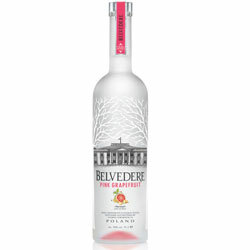 Belvedere Pink Grapefruit is the perfect accompaniment to spicy and exotic foods. The pairing of citrus and ginger is an established combination and both flavors are cleansing and complementary.